The church is an amazing thing. It’s made up of all kinds of different people – male and female, rich and poor, people from every tribe and tongue, and people with all different personalities. And these realities are true among us to some degree as well. We have different backgrounds and points of view that we bring with us into this congregation. “Jesus is our peace,” having broken down the barriers that divide us (Ephesians 2:14) Paul says, “For as many of you as were baptized into Christ have put on Christ. There is neither Jew nor Greek, there is neither slave nor free, there is neither male nor female, for you are all one in Christ Jesus.” (Galatians 3:27-28). So now, although we are many different people, we are one body in Christ and members of one another. “For as in one body we have many members, and the members do not all have the same function, so we, though many, are one body in Christ, and individually members one of another.” (Romans 12:4-5). And now, although we are from many different families, we are one family of brothers and sisters in the Lord. Paul says that we are “of the household of faith” – Galatians 6:10. And there are others references that could be added. All of these calls for peace give the distinct impression that this is not something that just happens. Peace is something we have to work toward. It is something we have to work hard toward. But also notice that in these verses the call is to peace, not just trying to cover over our conflicts so that no one thinks we have conflict, which is hypocrisy. Peace means being honest about it and working through our conflicts in love, so that we all have good relationships with each other and live in harmony. We are to work hard at this so that we can work together as one body, and so that we can get along as one family. Now, if I may say so, the problem today is that if there is conflict, instead of being at peace with one another, we just leave and go to another church down the street. We avoid conflict. We don’t do the hard work of loving each other enough to hang in there and sort things out. Let me say more. I wonder what it would be like if there wasn’t a church on every corner. What if being committed to a church was like being committed to a marriage – where you have to work things out? This is what God calls us to do. So let’s look at some ways to do this. This is a commitment each of us needs to make. Love is the source of our peace. Let your love for each other grow cold, and you will see our peace disappear. Here’s a different way to look at all this. God has put us together for a reason, so that we can grow in our love for each other. So maybe that person you can’t get along with is specifically here to help you grow. Maybe that person that rubs you the wrong way is here for your benefit; a gift of God to you, to help you learn to love more deeply. And so if you go off to another church in order to avoid them (thinking perhaps that other churches don’t have such problems), maybe you are really running from God. And who knows? Maybe God will put someone just like them in the new church you go to – for your benefit. Does the person annoy you? Ask God for more love. And ask God to give you his eyes for that person so that you can see what is good about that person and why God loves them. And pray for that person. This not only is a blessing for them, it is a tremendous way to change your heart and your attitudes toward the person. We’ve got to grow in our love for one another. We have to be careful not to let our differences divide us. For instance, those who are older and those who are younger – generational differences. Or those who live in the city and those who don’t. Or even something as simple as the youth letting what school they go to divide them. Love should push us to be with others. And our love should pull others into our circles. We are all a family here, brothers and sisters in the Lord. This is what defines us, not our differences. This is a particular part of love that I want to highlight here. 1 Corinthians 13 also says, “Love bears all things” and “Love is patient.” Paul says in Colossians 3:12-13, “Put on then, as God’s chosen ones, holy and beloved, compassion, kindness, humility, meekness, and patience, bearing with one another . . ..” We need all these things, but I am especially focused on patience and bearing with one another. People can rub us the wrong way. And so we need patience. Patience means longsuffering, or the ability to suffer for a long time – in this case with other’s weaknesses. We need to learn to bear with each other’s quirks and idiosyncrasies (and of course, hope and pray they bear with ours). A part of this is learning to overlook minor issues. Proverbs 19;11 says, “Good sense makes one slow to anger, and it is his glory to overlook an offense.” So don’t get angry over every little thing that happens. Be able to discern what is a minor issue and what has to be dealt with because it is truly important. This principle is taught in Matthew 18:15. Go to the person in private to talk. Often the conflict is based on misunderstanding and can be settled easily. This also makes sure we avoid two really big mistakes. 1) Judging by appearances. We assume we know what is going on based on what we can see from a distance. And we usually assume the worst of motives in others. But we don’t know the whole story. In John 7:24 Jesus says, “do not judge by appearances, but judge with right judgment.” You can’t do this until you talk to the person to find out what is going on. 2) Gossip. Don’t involve others inappropriately in the conflict. The issue is between the ones in conflict and so don’t go around telling everyone your point of view so that people start taking sides. Both of these are real temptations, but we must learn to deal with the person face to face. It’s easy only to focus on making sure others know where we are coming from. But love compels us to seek to understand where the other person is coming from. James 1:19 says in part, “Know this, my beloved brothers and sisters: let every person be quick to hear, slow to speak . . ..” Quick to listen to others, slow to say what we think. This isn’t something that comes naturally. If you need to, find a compromise. Philippians 2:4 says, “Let each of you look not only to his own interests, but also to the interests of others.” It’s not just about us and getting what we want, there is also a concern for the other and their needs and desires. If this fails, let some mature believers help. 1 Corinthians 6:1-7 tells us first of all, don’t take each other to a secular court! Then he asks in v. 5, “Can it be that there is no one among you wise enough to settle a dispute between the brothers . . .?” Surely God has given congregations those who can help settle disputes. And we need to be open to a mediator or even an arranged settlement that puts an end to a conflict. So these are some ways that we work at living in harmony with one another. I encourage you to act on them as there is need. And remember, what makes us different from the world is not that we never have conflict. It is that we love each other enough to work through our issues and that we do this in a loving way. This is our witness to the world – that Jesus makes a difference in how we live. Jesus teaches us to baptize those who choose to follow him. And this is what we’re doing here today. On the diagram below notice Egypt as the place of slavery and then Mt. Sinai – the mountain of God. And in between these two are the waters of the Red Sea. Remember, as the Israelites tried to escape their misery and slavery in Egypt, Pharaoh’s army came to kill them. And the waters of the Red Sea blocked Israel and they were about to be destroyed. In Hebrew thought the deep waters are evil. They represent judgment and death. God, however, acted to deliver Israel from judgment and death. He divided the sea, making a path for Israel to make it to the other side; to fully escape their old life. There are five parts to this event. 1. Israel left Egypt behind. 2. Israel was set free from judgment and death. They went through the waters of destruction safely to the other side. 3. They had a Spirit experience. As the came up on the other shore they sang prophetic songs by the Spirit. 4. They became a new people. As they came up on the other side, they were no longer a ragtag group of slaves. They were the people of God. 5. They committed to obey God. After they came out of the waters, they traveled to Mt Sinai and committed to obey God’s Law. 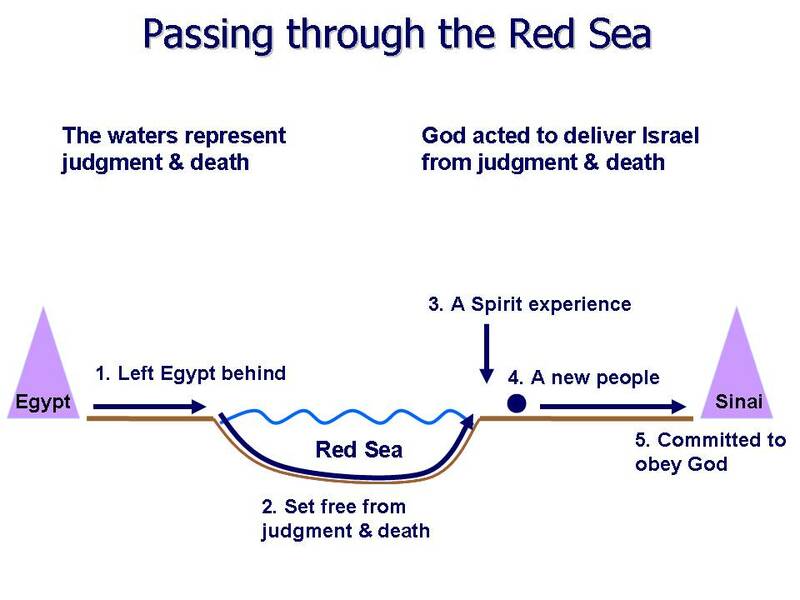 Well there is a parallel between this Red Sea crossing and Christian water baptism. Like we just saw, the waters here also represent judgment and death. But God has intervened for us. Through Jesus, God delivers us from judgment and death. He makes a way for us to cross over to the other side. And there are five parts to this. 1. When we come to the waters of baptism, we portray that we have left behind our old life through repentance. Just like Israel left Egypt behind, so we leave our old, sinful life in the world behind. 2. 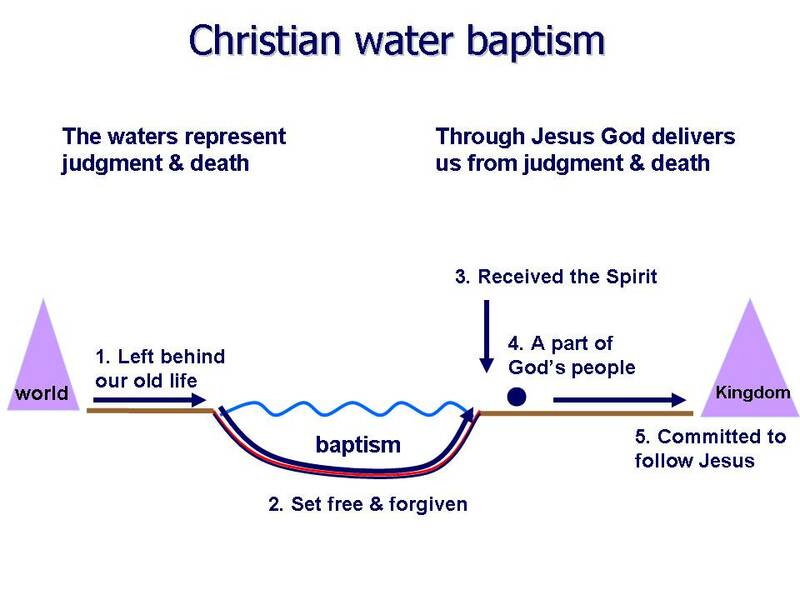 When we go through the waters of baptism, we acknowledge that we are set free and forgiven. Just as with Israel, judgment and death can’t touch us anymore. We testify that our sins are forgiven (or washed away). That’s why we can go through the waters and not be harmed. 3. As we come up out of the water “on the other shore,” as it were, we acknowledge that we have received the Spirit. Just like when Israel came up on the other shore and they had a Spirit experience, so we testify that we have received the Spirit who gives new life. 4. When we come up out of the waters, we acknowledge that we are now a part of God’s people. Just as Israel became God’s people, we show that we have left the world behind and we are now a part of God’s people; that this is our true community. 5. When we come up out of the waters, we acknowledge that we are committed to follow Jesus. Just as Israel went on to Sinai and committed to obey God, we show our commitment to a new way of life; to doing God’s will from now on, just as Jesus has taught us. Baptism is a symbolic testimony that this is all true in our lives. And this is the testimony of each of these who will come forward today. Anger is something we all struggle with, and it can really damage and destroy our relationships with each other. It also is a false substitute for the process of dealing with those who have offended you. Instead of going to the offender in love and seeking peace, as Jesus teaches, we go in anger to verbally (or otherwise) punish them. So today we look at the danger of anger and next week, Lord willing, righteous anger. Why? 1) Anger is difficult to control. It is explosive, like a fire that quickly rages out of control. As Proverbs 27:4 says, anger is “overwhelming.” We become angry but can’t control our anger. 2) Our anger is often guided by our own distorted sense of what God wants us to do. It stirs us up – but to do what? We often have a warped understanding of justice that turns our behavior into hateful vengeance. And as Christians, we often forget the way of Jesus and ignore God’s call to mercy, love of enemies and forgiveness. Instead, in our anger, we seek to punish others. 1) Instead of loving others – it can lead us to murder – Genesis 4:5-7. Cain felt he had been wronged when God did not accept his offering, but did accept his brother’s. This made him angry. He did not control his anger and it led him to murder his brother. 3) Instead of living in peace with each other – it leads to quarreling and strife. Proverbs 15:18 says, “A hot-tempered person stirs up strife.” Anger often leaves in its wake wounded people and broken relationships. 4) Instead of kindness to others – it leads us to be cruel in our words and actions – Proverbs 27:4. Our anger makes us say things and do things that are extreme and cruel to others – things we wouldn’t do and say if we were not angry. 5) Instead of being willing to love and forgive – it leads us to hold on to bitterness. Bitterness is an unwillingness to forgive. Ephesians 4:31 says, “Let all bitterness and wrath and anger and clamor and slander be put away from you.” Notice the connection between bitterness and anger is this verse. Not only does it destroy our relationships with others . . .
We cannot be in right relationship with God, when we are not in right relationship with others. This is a principle that the NT teaches. We see this in the following. 2) It leads to our condemnation before God. Galatians 5:19-21 teaches that outbursts of anger are works of the flesh. It then goes on to say, “Those who do such things will not inherit the kingdom of God.” Colossians 3:8 says, “But now you must get rid of all such things – anger, wrath . . ..” These things are a part of our old life that is to die. In verse 6 Paul says, “on account of these things the wrath of God is coming.” Our sinful anger lead to an outbreak of God’s righteous anger. Matthew 5:22 teaches that even simple words of angry insult like “you fool,” will lead to our condemnation before God as a breaking of the sixth commandment. What I’m saying is that anger is so hard to control, so easily corruptible, so easily leads us to sin, and the consequences are so grave – we must beware! 3) Anger is do dangerous . . . We should be careful not to provoke others to anger – which could cause them to stumble into sinful anger. Ephesians 6:4 says, “Fathers, do not provoke your children to anger . . ..” This admonition can certainly be more broadly applied in other relationships. Next week we’ll talk about righteous anger – What anger looks like when it is not out of control; when it has not forgotten Jesus’ call to love our enemies; when it is not busy destroying our relationships with others and with God. But for today I want us to hear, and take home, and ponder the serious warnings in the scriptures about the dangers of anger – that we should beware!